Ziyara Muslim Spiritual Care is a non-profit 501(c) 3 educational entity dedicated to meeting the spiritual care needs of patients. It organizes training seminars to equip spiritual care providers with skills to respond to the religious and spiritual care needs of patients and their families in hospitals and other healthcare institutions. We consider Islamic chaplaincy a revival of the Sunnah of the Prophet Muhammad (PBUH) and a fulfillment of the Islamic obligation of visiting the sick. 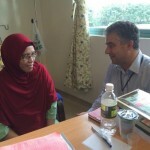 Ziyara Muslim Spiritual Care leads global efforts to train spiritual care professionals to serve in healthcare settings. Our training help prepare spiritual care providers to offer compassionate care, discuss the needs of our patients, serve as their advocates, and support patients in receiving religious and spiritual care services that are religiously authentic, scientific-based, patient-centered, and culturally competent.